The meeting sets the stage for what could be a historic detente between Washington and Pyongyang, who have technically been at war for more than six decades. The talks, scheduled for Tuesday, will be the first between a US and North Korean leader, and follow delicate diplomatic manoeuvres. The meeting marks a sharp turnaround in the status of Mr Kim from international pariah to global player. Just a few months ago, he and Mr Trump had been at loggerheads - trading insults and threats over Pyongyang's nuclear missile programme. Asked by a reporter how he is feeling about the summit after touching down, Mr Trump said: "Very good." Mr Trump arrived aboard Air Force One just a few hours after Mr Kim, who has only publicly left his country three times since taking power back in 2011. His visit to Singapore is his longest trip overseas as head of state. Mr Kim met Singaporean prime minister Lee Hsien Loong shortly after landing and said Singapore's role would be recorded in history if the summit was a success. Mr Trump has previously raised the prospect of reaching a deal with Mr Kim to scrap his nuclear arsenal, which has posed a growing threat to the US. 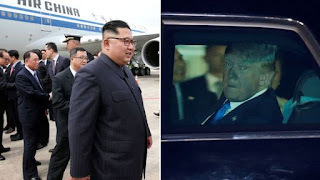 However, he subsequently revised his expectations and has spoken more of forging links with Mr Kim to start negotiations. Mr Trump has said he will "know within a minute" if the North Korean leader is serious.